For the past week, we've enjoyed some breezy, nice, spring weather filled with green grass, a filled and flowing school pond, and cherry blossoms blooming all over campus. Then this morning we wake up to BROWN. As much as we didn't want to get outside, M'Lynn dutifully took Kanyon to preschool (and picked him up). Along the way, she stopped to by a face mask for both of them to keep the brown out of their lungs. Later around lunch, I had to trek out into the brown for a meeting. What a day! 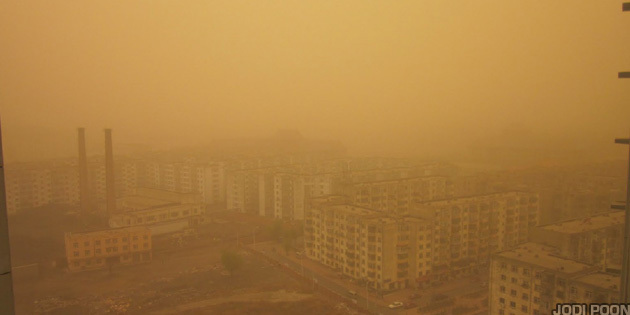 This sandstorm is the worst we've had in Harbin during our time here. Most of the days are filled will blue skies, big puffy clouds, and a slight breeze. Even when is unbearably cold outside, Harbin has sunny blue skies. I can only hope the reports are correct that the storms will abate in a couple of days. Rain, rain, come again. Wash away this brown yuck.